When it comes to buying gifts this Christmas, there are a lot of wonderful gift ideas to choose from for the business professional in your life: calendars, chocolate, coffee, gift baskets, desk accessories, etc. But what if you are the sort of Santa that thinks outside the gift box. You might want to consider a gift that could be used daily. One that could keep them organized or make their job easier. If this is the case, McAleer’s can help you find what you are looking for this holiday season. We stock a wide variety of office furniture that would suit any workspace or home office. If the person on your shopping list could use a little organization in their life, new furniture could be just what they need. The first step towards organization is a great piece of office furniture, like a desk or filing cabinet. The extra storage will provide them with what they need to keep the clutter out of their lives. An ergonomic chair is also a great gift idea. Since the average worker spends 7 to 8 hours a day, five days a week in their office chair, providing them with comfort is the Christmas gift that keeps on giving. 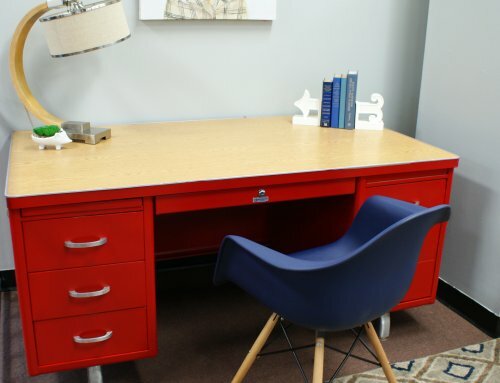 If you are shopping for a student, a laptop desk or bookcase will brighten their holiday. What if the person on your list just got a brand new TV? McAleer’s also stocks a great selection of entertainment furniture. If you are still stumped on what to get, you can always purchase a gift certificate and let the person on your list pick something out for themselves. This holiday season you don’t have to get the boss another neck tie, you can get him something unexpected. Stop by one of our showrooms to see our great selection of in-stock office furniture. Worried you won’t get it by Christmas? At McAleer’s all in-stock furniture can be delivered locally the next day!